Avenge HD uses the grease-cutting ability of ammonia without the noxious fumes. You won't believe what this heavy-duty prespray does to built-up hair and body oils, food and protein stains, newsprint, soot, cosmetics and even ink. 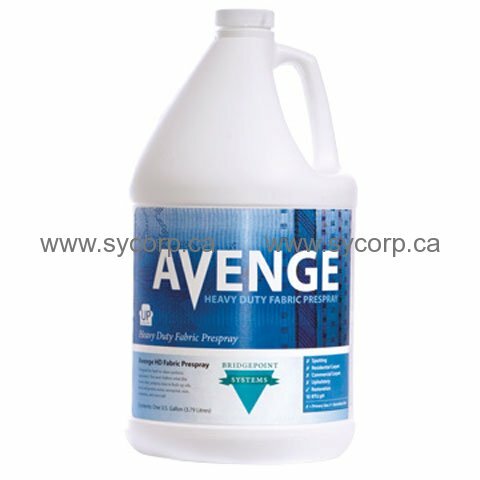 Avenge HD is an alkaline pH blend of surfactants, solvents and builders formulated to emulsify the toughest soils and oils found in hard to clean synthetic upholstery fabrics. Avenge HD has a dual surfactant and solvent system that combine for unequaled cleaning results. Rinse with Avenge Clean Rinse or Fab-Set.